FyrFlyz, a spinning toy, are ready to light up toy industry. Joel Rosenzweig wanted to do something extra special for his son's Bar Mitzvah last year. The something special turned out to be a new toy, which isn't much of a surprise. 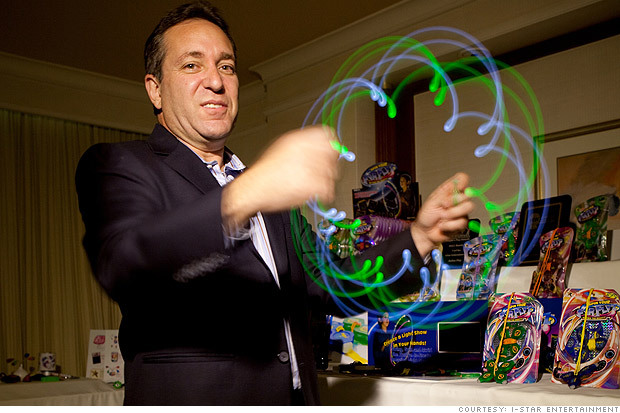 Rosenzweig is a 20-year veteran of the toy industry and heads i-Star Entertainment, a toy maker with eight employees. With just a few weeks to go before the family event, he got cracking on a prototype. Taking two pieces of plastic tied together, tiny lights and string he created what would become FyrFlyz. The idea is to grab the ends of the string and spin the toy quickly until it becomes taut. The lights made different patterns with each spin. Rosenzweig handmade 140 and gave them out at the Bar Mitzvah. "The kids started playing with them and immediately knew how to use them," he said. "I knew I had something." Two days later, he was on a plane to Hong Kong to find a manufacturer to make FyrFlyz. FyrFlyz, which looks a little bit different than the prototype, launched last month in the United States in toy stores and drug stores nationwide. It's a simple, battery-operated hour glass-shaped plastic shell with LED lights on both ends. "The $10 price is also key in this economy," said Rosenzweig. FyrFlyz has already made it on to several hottest toys lists for 2011 and won three prestigious awards, included Time to Play's "Top 15 most-wanted holiday toys for 2011." Not resting on his laurels, Rosenzweig is already extending the line. Next spring, FyrFlyz will come in three different colors and maybe even include music, he said. For these five women, breast cancer inspired them to start unique businesses to help others. Justin Bieber's haircut cost me $100,000!